Worried about tackling a big project or bogged down part way through? 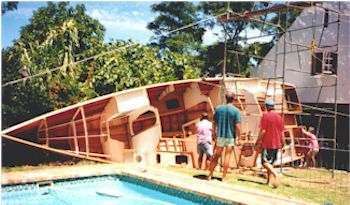 Having been through the process of building three large boats as an amateur, with all its ups and downs, Dudley Dix can offer advice to anyone considering building a boat or bogged down in the middle of it. The principles explained can be applied to any project, whether big or small, boatbuilding or otherwise. Follow this advice and you will see your project through to it's intended conclusion. Almost anyone can build a boat. For most people it is more a matter of having the will to do it than being properly equipped physically for the job. To justify that statement I will draw on examples that I have seen or been aware of in the past. I am sure that there have been many others as well. ~ My wife and I visited a client in Canada in the 1980s. He had built a 3-storey home and retail shop for his family with his own hands. He had bought plans to build a Pratique 35 that he was about to start. I found him on the roof of his in-laws house, at the top of a ladder that was leaning against the chimney. The job that he was doing was attaching a TV antenna to the top of a very tall pole that he had planted in the ground and which extended well above the chimney. That is a big enough single-handed undertaking for a fully able-bodied person. This man had an artificial leg. ~ I know a boatbuilder who can match the craftsmanship in timber or GRP of almost any builder in the world, in terms of both intricacy and standard of finish. 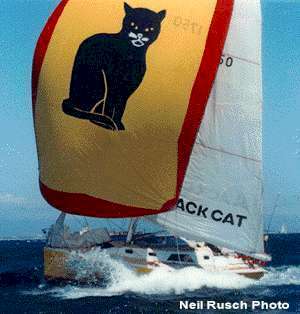 When I first met him, he was sailing a Mosquito 16ft catamaran single-handed on trapeze, with both jib and mainsail set. He has no hand on one arm and only a thumb on the other, no fingers. ~ In the 1970s there was a couple from Zimbabwe (then named Rhodesia) who built a Hartley ferro-cement offshore cruiser. They had it transported overland to Durban, sailed from there to Cape Town with a skipper on-board, then went cruising by themselves. They were both paraplegics and could only move around in wheelchairs or by sliding themselves along the deck. ~ I know a man from Durban who bought a 33ft GRP cruiser/racer hull and deck and fitted it out himself. After a few years of coastal sailing, he set off on a single-handed trans-ocean passage from Durban, South Africa, to Perth, Australia. This man is blind. The common factors among these people is that they have the willpower to achieve whatever they want. They have overcome their handicaps and don't feel sorry for themselves. They are committed to making the most of the situations in which they find themselves. In contrast, many able-bodied people give up way too easily and look for excuses why they cannot complete , or possibly even start, the job. Mental attitude is the most important deciding factor in the success or otherwise of a boatbuilding project. As for me, I don't have any physical handicaps. Nor do I claim to have the willpower exhibited by these people. However, I have now been through the process of amateur boatbuilding on a large scale three times in the space of 20 years. Some will ask how I can be an amateur boatbuilder when I work as a professional in the boating industry. Let me assure you that I have no pretences of nor aspirations to being a professional when it comes to building boats. I build strictly for myself, I generally build out of doors and I build on a tight budget, scrimping and depriving myself and my family of all luxuries in the interests of putting my next boat on the water. Those are the worst characteristics of an amateur builder. There are also some redeeming features, none of which come readily to mind. The first boat which I built was a 36 footer designed by van de Stadt. I was in my mid twenties, full of energy and knowing nothing whatsoever about ocean sailing, just eager to get out there and do it. She took 33 months, with lots of assistance from friends and family. We were going to sail the Cape to Rio Race together. The seas off Cape Town soon showed most of us that life on the ocean would not always be as smooth as we had expected. The long distance sailing plans evaporated and we limited our sailing to local waters where we were able to quickly return to terra firma if the terror of the ocean became too much to bear. It was while building that boat that I became interested in boat design. Being a Taurus (stubborn, of course), I do not give up easily. Despite the "mal de mer" I ploughed headlong into a new life aimed at one day being able to design boats. Then, part way through my design studies, all hell broke loose. I entered the first complete design I had ever done (a 32 footer) into an international yacht design competition and it won. (This was the CW975, which won the 1979 Cruising World Design Competition.) Suddenly life was turned upside down, my boat was up for sale and I was again building a boat. After all, no self-respecting yacht designer would own a boat designed by someone else so it was fate that was to blame, not me. That boat somehow lost its way. It took seven years to get onto the water. No fault of mine, I know. In that time I owner-built a new house and did a few other distracting things. She started construction at one location then was moved to the new (but incomplete) house, where she played a very distant second fiddle. Eventually I got my mind right and she was launched. Please note that in between these big projects were some smaller ones. A dinghy or two and a catamaran. Got to keep the eye and hand in, you know. Sailing the Cape to Rio Race in 1993 (by now I had the sea sickness more or less under control) I was bitten again by the need to build another big boat. This one was going to be for the next race in three years time. Three years seemed plenty of time to do it. However, I first had to get back home, break the news gently to my wife, accumulate a bit of money to start construction and last (and by no means least) I also had to design the new boat. So the planning started and the design progressed. One essential ingredient evaded me - the money. When that suddenly came, I no longer had the time to build the boat which I had planned (nor enough money). The concept changed into something more innovative, a concept which would be both quicker and cheaper to build. (This boat became the prototype of the Didi 38 design, which I have since followed with the Didi 26, Didi 34, Mount Gay 30 and Didi Mini of similar construction. I have called this the Radius Chine Plywood method of boatbuilding.) By the time that I started the first cut, I had 2 years, almost to the day, before the start of the next race. This boat was the biggest to date but she took only 22 months to reach the water. Most of the building was single handed, with friends doing about 20% of the work. I was well motivated throughout that project, then personally sailed her 10000 miles in her first four months on the water. What this introduction intends is to show you that I am well qualified to discuss the subject of this article. I have experienced the ups and downs of amateur boat building. I think that the only side which I have not seen is failure to complete a project. Past experience has shown me that it is far easier to keep going uninterrupted than to stop for a week or two then start again. A two week holiday breaks the work rhythm and results in another week in trying to get back into stride. I am not saying that you must not take any breaks, just that they will cause a bigger interruption than you expect. After you take the holiday you must make a conscious effort to get back into your stride as quickly as possible. A major part of maintaining momentum throughout the project is keeping the overall project in mind all the time. It helps with planning the next job or two along the route. You should have a few jobs on the go at a time, for example one inside the boat, another on deck and a third in the workshop. This allows you to keep working irrespective of weather conditions or time of day or night. It also allows you to be working on one job while the glue sets on another. You must also not allow yourself to be side-tracked by minor issues. It is all too easy to become engrossed in doing a perfect job on some small detail which is possibly not that important. These little details can mount up to years of construction time. By this I don't mean stay within your known limits. That way we achieve little. It is always worthwhile to stretch your limits a bit because your work will improve to keep pace, as long as you stretch yourself a little at a time. Don't underestimate your own abilities because they will also improve with use. However, don't set yourself goals which will break you either. You will then be disheartened and will give up, to probably never try again. Your excuse will be "I tried but couldn't do it" and others will agree. A self-defeating attitude. This gives you a reason to reward yourself at intervals during construction, when significant stages are completed. Buy yourself a new tool or piece of equipment that you want as soon as you pass the milestone. Set your sites on it and don't cheat yourself. You will have deserved the treat. I find that a party is the most effective reward and has the added benefit of uniting others by giving them a link to the project. Invite your friends, relatives and anyone who has helped in some way with the project. Invite your neighbours also because it will give them an affinity to what you are doing. They will feel less inclined to complain if you make noise a bit later than you should. Make it a barbecue or outdoor cocktail party near to the boat so that you can show off what you are doing. You should be proud of your work and now is the time to glow a bit. A party also allows you to wind down a bit and gather your energy for the next stage. 1) Laying the keel or setting up the first frame. By this stage you will have done a fair amount of work in building frames and other preliminary jobs. 2) Turning the hull. This can be a big party. You can choose a method of turning which will allow all to feel that they had a hand in it, even if you would possibly have managed the job all by yourself. 3) Roof wetting, when the deck and cabin are completed. 4) Keel fitting, if not done on launch day. This is another big day, with your low profile hull suddenly becoming tall for all to see over the garden wall. 5) Any change of location. My boats had to move through the garage the day before the flatbed arrived to haul them away. Moving them on rollers can use lots of helping hands, followed by a big celebration. 6) Any other suitable occasion which fits into your building project. 7) Of course, the launch party, the biggest one of all. Here you can really strut your stuff with pride. Keep the overall concept of your boat clear in your mind. It will help you to keep focussed on important aspects of the construction, stop you from wasting your energy on unimportant items and help you to maintain confidence in the progress of the project. Have an approximate launch date in mind, it will give you a target toward which you can work. Some of the builders whom I know say to me that they will launch when the boat is ready, they don't want to even estimate launch dates. Those boats, almost without exception, take forever to reach completion, as is the wont of most open-ended projects. A target launch date gives some urgency to the project. If you have a date which cannot be changed, such as I had with the start of the Cape to Rio Race, you only have two choices. Make the target or forget about it because you will be wasting your time and effort. In that sense the target which you set yourself must be achievable. Any one of us can produce a work of art when we build a boat. Hower, it takes a lot of time to do so. That is OK if you are building it as a hobby, wanting only to get enjoyment out of the building process. It is also OK if you are building the boat as an investment. In that case, the time put into improving details and finishes will be worth it. However, if you are building with the intention of going cruising in a few years, the extra time can seriously knock your cruising plans. For your cruiser you need a home, not a palace. You need it to be comfortable, neat and functional. Fancy custom turned woodwork can give you pleasure to look at but serves no function in the working of the ship. You will need determination to achieve your goals. Don't be discouraged by setbacks, instead you must look at them as part of a learning experience. Analyse the setbacks to see where you went wrong, figure out how to get around the problem when you tackle it next time and determine to not make the same mistake again. You must bounce back from any setback. If what you are doing means enough to you then you won't give up. This is where it helps to be born under the correct star sign. The bull headed Taurus in me cannot be easily beaten into submission. Add to that my birth in the Chinese year of the ox and fate stands little chance of setting up a permanent barrier. The other factor which undoubtedly comes into it is that I am too stupid to know when I am beaten. By the time that I know that I should have been beaten by a situation, it has generally given up and gone off to look for a more sensitive person to prey on. Awhile back I had opportunity of visiting the Wright Brothers Museum at Kitty Hawk in North Carolina. That proved to be an education in determination and resilience. Wilbur and Orville Wright were bicycle builders with a passion to fly. They were convinced that man was capable of sustained flight and set out to succeed at it. They did kite and glider testing for over 10 years before attempting powered flight. During that period they lived in Ohio but did flight testing in North Carolina, transporting themselves and their craft by train. They did over 1000 glider flights in the process and developed the world's first wind tunnel, in which they tested and redefined the shapes of wing sections. They also developed methods to twist the wingtips to control banking for turning, whereas other builders were using the CG of the pilot to control the airplane. Their flights included many failures and crashes. Returning home to Ohio after one period of testing in which they had problems, one of the brothers said to the other "Never in 1000 years will man fly". They seriously considered giving up at that stage but picked themselves up and progressed, fueled by their passion and belief in what they were doing. In the process, they established many aeronautical principles still in use today and they developed the first generation of true foil sections that developed into modern wings. Wilbur and Orville Wright did work that impacted tremendously on the future of mankind. It is extremely unlikely that any of us will ever have similar impact with our boatbuilding projects but we can benefit from applying the same sort of determination and resilience to whatever we do. Always know what the next phase of the project is going to need in the way of materials and have them ready. Source any special tools which you will be needing. You can hire or borrow any which you don't own and will not be needing again. No sense in wasting money on buying it. Study the drawings to plan the next job. Think through any potential difficulties and understand the procedures involved. You will have time to seek expert advice on anything which you cannot figure out for yourself, either through reading in books or asking someone who has done the job before. One of the big time consumers throughout the construction is sourcing materials. Towards the end this becomes a major problem, when you are buying fittings, fasteners, wiring, pipes, paint etc. If care is not taken in planning these excursions they tend to overtake the boat. It is a major frustration if you are constantly running around for little bits and the boat hardly seems to progress. Better planning of the buying trips will reduce the frustration. If you are unsure of your abilities then your work will be hesitant. You need to cultivate your knowledge and your skills that will be needed during the project. First thing to do is to read, read, read and read some more. Many amateurs are reluctant to buy books to assist them in their boatbuiilding, expecting the plans that they have bought to include all of the information needed to build the boat. This is possible for small boat projects like dinghies but for larger boats this is unlikely. On those, you can expect a good spread of information and guidance on how to go about it but this needs to be supplemented by other reading. Experienced professional builders have reference books on their shelves, why should an amateur need less? Here are some suggestions. If you cannot source them from your local bookseller, they can be ordered from Amazon.com via links in the bookshop section of our website. For most methods of construction you can learn some of the required skills while doing the small bits of preliminary work which are generally needed before you get into the main project. Metal boats need building stocks and frames to be welded together long before you get to the plate welding stage. Wooden boats have frames and bulkheads to be made up. For GRP practise you can start with some of the smaller items which will be needed further into the project, like hatch covers, dorade boxes etc. There may be some major new skills which you will need to learn. You may be able to learn them from friends, otherwise consider doing courses at the local technical school. They normally cover such subjects as welding, metalwork, woodwork, electrical and plumbing. Some of the skills required to build a boat are pretty basic but, if you are out of your depth with any aspect, it is better to educate yourself before getting too deeply involved. If you are planning to build a boat from aluminum then it is particularly important that you educate yourself properly ahead of time. Aluminum is intolerant of sloppy or dirty workmanship. You will produce a boat of very suspect strength with serious potential for cracking the welds if your work is not up to scratch. Most of us have friends with special skills. We may not want to impose on them but they are often wanting to get involved in an interesting project. Make use of these friends when you can. In time the favours will balance out because you will help them with their projects or you can take them sailing as reward. Hire specialists if you know that you are out of your depth but do so as a last resort, if that is what is needed to achieve a sound job. We all flaunt safety at times, at our own peril. This should be resisted, sloppy work habits can waste a lot of time, aside from the pain and suffering caused to ourselves and others. Use proper protective clothing and equipment when using powertools, welding or working with noxious chemicals. This means goggles, masks, overalls, dust masks etc. It also means steel capped boots if working with thin plates, or you could see your toes wriggling on the ground like lizard tails. Work carefully when doing any job that is hazardous. Concentrate on the job on hand and don't let yourself be side-tracked by things irrelevant to what you are doing at the time. Also, follow the manufacturer's instructions for whatever power tool you are using. While building "Black Cat", I was working on making a whole bunch of small identical plywood items. It was repetitive work and simple to do. I was distracted after a telephone call and put my thumb through the radius cutter of my router. Spinning at around 20000 rpm, it made a terrible mess of the end of my thumb. It laid me off boat work for about a week and made it very uncomfortable for another month. Six years later it still gives me occasional problems. If I had not been distracted I would have saved myself a lot of hassle and wasted time. There are many stories of boats that have fallen over for various reasons or have been dropped from cranes. Mostly they are due to carelessness. Such an accident can kill or maim you or a helper, putting an end to your cruising plans. Better to work carefully instead. If you take a long break from the project, for whatever reason, it can be very difficult to motivate yourself back into it. You have lost the threads of what you were doing. You can't think where to start and just see this big incomplete project in front of you. You are overawed by the enormity of the task which waits for you. Whatever you do, don't panic. That just fuels the problem and you will procrastinate forever. Panic confuses your thinking. It also keeps you awake at night, which will make your daytine thinking even more fuzzy. Fight it down and calm you mind. Then you will sleep better and think more clearly in the morning. Start by sitting down and rationally taking stock of the state of the project. Don't do it in the living room poring over the drawings, that will aggravate your sense of panic. Don't do it in the workshop surrounded by piles of sawdust, tools and unused materials. Inside the boat is the best place to do this, whether she is still in framing or part way through fitting out. Look around the project, take pride in what you have already achieved because it will help to remotivate you. Identify a small job that will not take too much effort or time, like making a gusset, knee or locker door. Take your time to do a good job of it. Then identify another similar project and get that one done. You will start to feel the progress and regain your sense of achievement. Continuity, momentum and enthusiasm will follow. Before you know it you will be back into full stride with everything happening in logical sequence again. There are some basic principles which need to be applied to every amateur boatbuilding project, if success is to have a reasonable chance. The relative importance of the principles will depend on your own character, primarily tenacity and resilience. 1) Choose a boat of reasonable size. Seriously consider whether or not you really need a boat as large as the one which you have chosen. Remember that, for boats of similar concept and construction, the work will increase approximately in proportion to the increase in displacement. A 40% increase in length is likely to more than double the work (and cost). 2) Don't go for a complicated concept. Complicated building details or features slow down progress. Taken to extremes they will bog you down so that you will never finish. Keep it simple for success. 3) Don't be overawed by the thought of tackling a big project. Every big project is a series of little projects with a logical sequence. 4) View the overall project one step at a time. From the first step, the next logical one will always be clear. 5) Take your rewards at your milestones. You will have deserved them. Happy sailing - See you on the water.